Man, those guys are really going for it! Quickly looking through, it's definitely my kind of pick up and play system. Dice and stat wise it probably sits somewhere on a graph between the old HeroQuest board game and D&D - perhaps comparable with QUERPS or Advanced Fighting Fighting where there's a simple core system plus skills and spells. Design-wise, the stat symbol packed blocks look modern and easy to read - much like drawing an encounter card in a board game - it's quick reference for fast play. 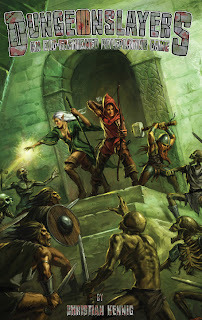 It was Kelly Davis, in a blog post comment, who recently drew my attention back to Dungeonslayers. He lured me in, my saying that my own tile designs would work well with the Dungeonslayer maps - and he is right! The designers of Dungeonslayers are fond of the blocky five foot thick walls between rooms - proper solid, no messing, dug out and flagged corridors. I feel I'm in good company here. The rules of Dungeonslayers were designed to be very basic and simple on purpose, to bring the charming flair of old-school gaming back to life. ... ... Despite the rules’ lack of details or possibly because of this, player characters tend to evolve into highly individual personalities. The rules are free to download, and yummy sounding pocket sized print version is also available to buy.